Loganberry Court — Hush Homes Inc. Established around 1850, Silverthorn Mill was the hub of the community, drawing its power from the nearby Credit River. This location served as the bustling centre of Meadowvale Village's commercial life. Now, Silverthorn Mill represents the gateway to the Old Meadowvale area. Flanked by an established neighbourhood, Silverthorn Mill rests atop a slight hill creating a stately feel. Residents enjoy this historic enclave, which is desirably private and close to sought-after urban amenities such as good schools, shopping, recreation, and more. Well-treed, the landscape inspired the nomenclature of each of this site's thirteen unique French-style inspired homes. The stately homes of Silverton Mill offer romantic architectural detailing such as turrets, bell towers, gable roofs, and stone and stucco finishes. Appreciate the enchanted village setting and enjoy the comfort and pride of ownership these homes bring. As the perfect complement to the perfect site, we selected a style that brought a fresh new look to the feel of this extended heritage district. French Normandy, in?uenced by the French Provincial château. With their grand dimensions, these château-style homes are romantic, stately and re?ned. Set off by generous lots, each home is de?ned by its own individual architectural character. 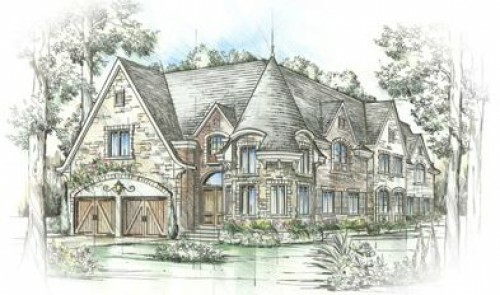 Some of the exterior elements that make these homes distinct include gable and shed dormers, steep roofs with one-and-a-half storey roof lines, French door-style windows with shutters, high quality masonry, ironwork and lighting. Of particular note are the four homes that resemble miniature castles. These particular homes anchor the site beautifully and are situated on key corner lots. Silverthorn Mill is located at the corner of Silverthorn Mill Avenue and Second Line West, and serves as the gateway to the Old Meadowvale area. Neighbouring lushly treed countryside and a protected greenbelt, the homes on this two-and-a-half acre site are surrounded by established estate style properties. Like Schoolhouse Vale, Silverthorn Mill possesses the best of all worlds. Exit this tranquil private enclave and you are within walking distance to Old Meadowvale Village with its shops and distinct small town charm. Within a few minutes drive, you can take your pick of any of the surrounding park-lands or opt for more urban pleasures. For those who share the love of the country but appreciate that modern life is in the hub, this is nothing less than an idyllic location. HUSH embraces the idea of creating grounds and gardens that reflect the spirit and stateliness of each home. With frontages between 60' and 140', the landscaping provides space enough for a design that both complements the natural environment and provides privacy and a sense of English garden lush. Every lot will have its own landscape plan designed by professional Landscape Architects.The standard features will consist of cobbled walkways and sitting areas, complemented by shrubs, bushes and borders to create year-round colour, texture and interest. HUSH’s upgraded landscaping continues the spirit of the standard landscaping but enlarges the vision. Pathways will be upgraded to paving stones, while bedding areas will be expanded. With more trees and shrubs, the overall feel will be of estate- or manor-style grounds where pathways, a mix of trees, shrubbery and seasonal blooms create a garden designed to engage the senses. Every lot will have its own landscape plan designed by professional Landscape Architects. All home buyers, will also have the opportunity to customize their landscapes through one-on-one meetings with the landscape architect.